Louis Jarvis, Jr. and his wife Jennifer Jones were charged with driving while intoxicated arising out of separate but related incidents on the same evening. Both pled no contest to the charges against them. But before they were found guilty, it was discovered that neither complaint against Jarvis or Jones alleged a year that the offense was committed. The trial court granted their motions to acquit. The State appealed. The State filed a motion for a rehearing in the two cases and argued that “acquittals could not be entered because jeopardy had not attached, the trial court had never accepted the no-contest pleas and found the defendants guilty, and effectively dismissing with prejudice the prosecutions was improper.” The trial court denied the motions for rehearing. The State appealed. The Tenth Court of Appeals then reviewed the appeal. The Tenth Court of Appeals disagreed that the State had accepted a burden of proof. The Court held that the State is not required to introduce any evidence to support a plea to a misdemeanor and that the trial court has not authority to weigh the sufficiency of the evidence in a guilty plea to a misdemeanor case. The Court found that the Trial Court’s problem was with the State’s charging instruments, not with the State’s evidence. The Appellate Court concluded that this was not an acquittal but was a dismissal with prejudice without the State’s consent. This might sound like the same outcome, but it is in fact very different. A dismissal, usually occurring before trial begins, means that a case can be tried again so long as the statute of limitations has not expired. Whereas, an acquittal means that a trial was held (and jeopardy attached) and now the defendant cannot be tried again for this matter. 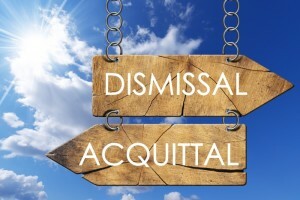 Though these seem like subtle nuances, the difference between an acquittal and a dismissal can have huge implications on the defendant. The Tenth Court of Appeals went on to determine whether Jeopardy attached in Jarvis’s case. The Court determined, “even if jeopardy attached, because, as we have held, the trial court granted a defense motion to dismiss the prosecution on a legal basis unrelated to guilt or innocence and ‘without ultimately addressing the issue of guilt or innocence, there is no double jeopardy impediment to the State’s appeal.’” In essence, because the cases concluded with a DISMISSAL and not an ACQUITTAL, the defendants can now be retried under a new information that alleges the proper date. For more information, read the court’s full opinion in State v. Jarvis.